Denmark is located in northern Europe. The main part of it is Jutland, a peninsula north of Germany, but also with a number of islands. The southernmost of the Nordic countries, it is located southwest of Sweden and south of Norway, and bordered to the south by Germany. Denmark is considered culturally to be part of Scandinavia. Denmark’s population is about 5.7 million. 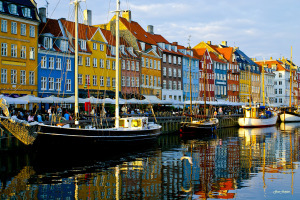 Its capital, Copenhagen, is also its largest city and the commercial and cultural center of the country. Once the seat of Viking raiders and later a major north European power, Denmark has evolved into a modern, prosperous nation. Danes enjoy a high standard of living and the country ranks highly in numerous comparisons of national performance, including education, health care, protection of civil liberties, democratic governance, economic prosperity and human development. Geographically, Denmark is dominated by mildly undulating agricultural landscapes, forests, minor lakes, extensive costal dunes, and marshes. No location is further than 32 miles (52 km) from the coast. The coastal scenery itself can be quite varied, and it includes the white cliffs of Møn, forested and deserted dune areas such as those near Skagen (including Råbjerg Mile and Rubjerg Knude), the cliffs of the Stevns peninsula and those of Bulbjerg and the Fur island. 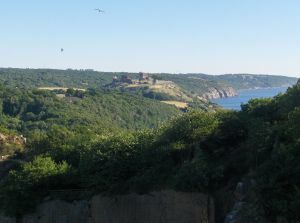 Bornholm is a Danish island located east of mainland Denmark, in the Baltic Sea. It is known for the sandy beaches on the south of the island, and rugged, forested interior. Bornholm is also known for its historic city, Svaneke, and for its distinctive round churches. Copenhagen is the capital and largest city of Denmark. Located in the eastern part of the country, Copenhagen is a cultural and geographic link between mainland Europe and Scandinavia. It is is big enough to be a metropolis with diverse cultural events, museums and galleries and good nightlife, yet still small enough to be intimate and easy to navigate. 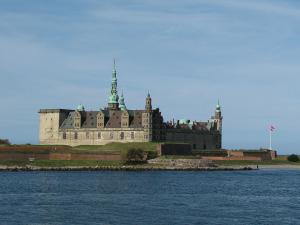 The grand castle of Kronborg is a UNSESCO World Heritage Site that dominates the Danish town of Helsingor, known to Hamlet fans as Elsinore and home to the Danish prince. In addition to its famous castle, the area is known for its scenic town center and its historic harbor, with museums and other cultural sites. Roskilde is a small town located in eastern Denmark. 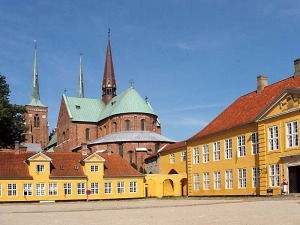 It is an ancient city dating from the Viking age most famous for its cathedral, a UNESCO World Heritage Site. Other important sites include the Viking Museum. The historic center is small and easy to navigate. Skagen is the northernmost town in Denmark. It is a year-round fishing town, with an extensive fishing fleet, as well as related food industries and other industries that support the fleet. During the summer, its extensive beaches and migrating sand dunes attract visitors, with lovely oceanside views.